This Mudflap is approximately 12 inches wide by 22 inches long by 3/8 inch thick. Application: FRONT of all full size Dodge 1994 thru 2002 2500/3500 pickups with stock wheels and tires. Mounting: Comes with 8 self tapping Stainless Steel screws and washers for mounting. Serviceability: Mudflap is shaped specifically to fit inside the front fenderwell of the 1994-2002 Dodge. Allows for easy & precise alignment. This is a Drill-Less Mudflap, approximately 12 inches wide by 3/8 inch thick. Designed to hang approximately 10 inches below the fender well. Application: FRONT of all full-size Dodge 2003 thru 2009 current pickups. If your truck is a Power Wagon, we do have a drill-less mudflap to fit. Just let us know on the questionnaire & we will send you the correct mudflap. Serviceability: Mudflap is pre-drilled and requires no drilling of additional holes in your truck. Allows for easy & precise alignment, and drill-less installation. This is approximately 20 inches wide by 3/8 inch thick; and designed to hang approximately 14 inches below fenderwell. Application: REAR of all 4WD Dually trucks 2003 thru 2009. If your Dodge is a Mega Cab please note this in the comment box on order form. That will require a slightly different shaped mud flap for the rear. This is approximately 20 inches wide by 3/8 inch thick and designed to hang approximately 15 inches below fenderwell. Application: REAR of all 4WD Dually MEGA CAB trucks 2003 thru 2009. This is approximately 20 inches wide by 3/8 inch thick; and designed to hang approximately 12 inches below fenderwell. Application: REAR of all 2WD Dually trucks 2003 thru 2009. If your Dodge is a Mega Cab please note this in the comment box on order form. That will require a slightly different shaped mud flap for the rear. Application: REAR of all 2WD Dually MEGA CAB trucks 2003 thru 2009. This DF2 10 4500 is a Drill-Less Mudflap, approximately 12 inches wide by 3/8 inch thick, designed to hang approximately 10 inches below the fender well. This DF8 10 Plus 4500 is a Drill-Less Mudflap, approximately 14 inches wide by 3/8 inch thick, designed to hang approximately 12 inches below the fender well. Application: FRONT of all Dodge 4500/5500 2010 thru Current pickups wanting the maximum protection for the side of their truck, and the back fenders. This Mudflap for a Dodge 4500 is a drill-less installation, approximately 14 inches wide by 3/8 inch thick, designed to hang approximately 10 inches below the fender well. Application: FRONT of Dodge 4500/5500 2010 thru Current pickups, desiring optimum coverage. Mounting: DuraFlap mounting hardware is made of stainless steel where available. Other mounting products are made of anti-corrosive and rust resistant materials. 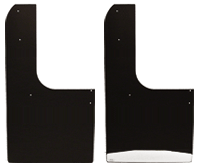 Our drill-less Mudflaps are custom designed to utilize existing factory holes and other mounting points available o n your truck. Instructions included. Application: FRONT of all Single Rear Wheel size Dodge 2010 thru 2013 AND all Dual Rear Wheel Dodge 2010-2012 pickups. This is a Drill-Less Mudflap, approximately 12 inches wide by 3/8 inch thick. Designed to hang approximately 10 inches below the fender well on a 4WD. This is a Drill-Less Mudflap, approximately 14 inches wide by 3/8 inch thick. Designed to hang approximately 8 inches below the fender well on a 4WD and hang approximately 7 inches below the fender well on a 2WD. Application: FRONT of all Single Rear Wheel size Dodge 2010 thru 2013 AND all Dual Rear Wheel Dodge 2010-2012 pickups with wider tires. Application: FRONT of all full-size Dodge 2013 thru current single rear wheel Dodge full-size pickups and 2013 thru current Dodge dually pickups that have been lifted or leveled and require extra length. This is a Drill-Less Mudflap, approximately 14 inches wide by 3/8 inch thick. Designed to hang approximately 12 inches below the fender well on a 4WD. Application: FRONT of all full-size Dodge 2013 thru current single rear wheel Dodge full size pickups and 2013 thru current Dodge dually pickups that have been lifted or leveled and require extra length and extra width. This Mudflap is approximately 14 inches wide by 22 inches long by 3/8 inch thick. Application: FRONT of all full-size Dodge 1994 thru 2002 2500/3500 pickups with stock wheels and tires.. Mounting: Comes with 8 self-tapping Stainless Steel screws and washers for mounting. Serviceability: Mudflap is shaped specifically to fit inside the front fender wells of the 1994-2002 Dodge. Allows for easy & precise alignment. This no drill mud flap is approximately 20 inches wide by 3/8 inch thick and designed to hang approximately 12 inches below the fender well. Application:REAR of all 2WD Dually trucks 2010 thru Current. Mounting:Duraflap mounting hardware is made of stainless steel where available. Other mounting products are made of anti-corrosive and rust resistant materials. This pre-drilled mudflap requires no drilling through any metal, but does require one hole to be drilled thru the plastic liner for a snug fit. Serviceability:This Mudflap is Pre-drilled and requires no drilling of additional holes in your truck metal. Allows for easy & precise alignment. Application: FRONT of all full-size Dodge Ram 2003 thru 2009 pickups with non-stock lift and/or oversized wheels and tires. Instructions included. Mounting: Included Stainless Steel bolts, nuts, washers and self-tapping screws. Serviceability: Excellent protection for doors and running boards. Extra length available for lifted trucks. This Flat Bed Mudflap is approximately 24 inches wide by 3/8 inch thick, cut to the length needed. Let us know the length you want under comments. Application: REAR of Flat Bed Trucks requiring a wider mud flap to cover Dually wheels and tires, hanging near the back of the truck. Serviceability: This Mudflap is the Mudflap of choice for Dually Flat Bed trucks when the mud flap will be installed near the back of the truck. This Mudflap is approximately 20 inches wide by 24 inches tall by 3/8 inch thick. Application: REAR of all 2WD Dually trucks 1983 thru current. Mounting: Included Stainless Steel bolts, nuts and washers, one aluminum mounting plate per Mudflap. Serviceability: This Mudflap is the Mudflap of choice for non-stock 2WD dually drivers who demand the maximum in protection for both their truck and towable.